A sweet and colorful recipe for the funniest week of the year. 1 box of decorative meringues and / or gummy candies. Looking for a curious and tasty Carnival delicacy? 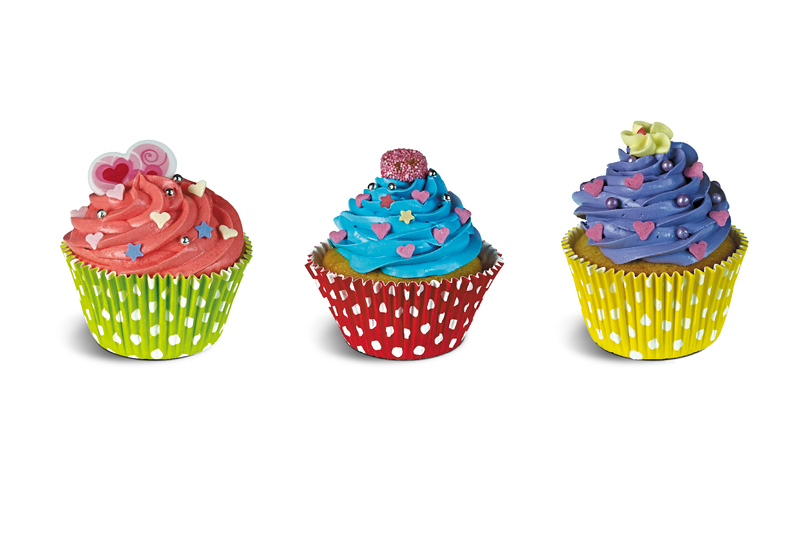 We propose the recipe for muffins with colored frosting, to be prepared with Novacart polka dot cups. Give free rein to your creativity and get ready to lick your mustache! Whisk eggs, sugar, honey until you get a smooth cream for 3 minutes in a bowl. Add oil, yoghurt and lemon flavor. Add the sifted flour with the wheat starch, the sieved yeast and the oil. Insert the dough into 12 colorful Novacart cups, place them in a preheated oven at 175 degrees and let them cook for 20 minutes. In the meantime, prepare the decorative cream, pouring mascarpone and sugar into a bowl with high sides, working them with spatulas. Add whipped cream and ricotta, stirring until you get a smooth cream. Divide the frosting thus obtained in four bowls and in each pour a different food colour. Consider that the more dye you add, the more colors will be bright. Once the four creams are obtained, divide them into four sac a poche and decorate the muffins as you like, adding the various food decorations, meringues and candies. Keep the decorated muffins in the fridge. The single-portion RD 130 H 40 baking cups are made of cardboard resistant to food fats and can withstand freezing and baking up to 220°C. They are also recyclable and biodegradable and do not need to be placed in a tray thanks to their self-standing structure. Novacart polka dots baking cups are available in several colors (green, red, yellow, blue and pink).